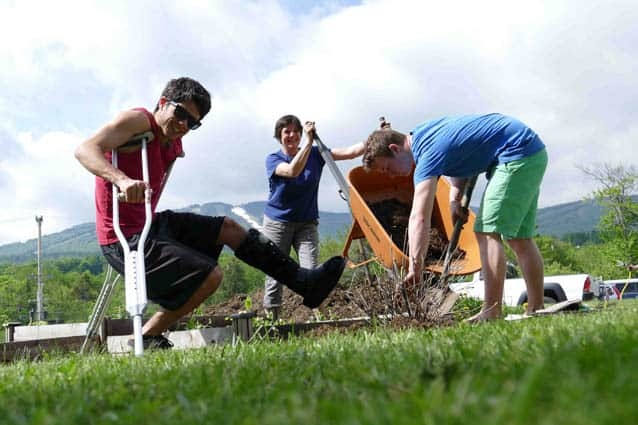 Killington Mountain School students work to beautify the school campus with gardens, games and spring cleaning. Students, coaches, faculty and staff worked together to get the KMS community garden planted, to build a horseshoe pit, to put up the basketball hoop, and even to wash windows, leaving the building and grounds sparkling from the several hours of spring cleaning. After a few hours of working in the warm and humid temperatures, everyone relaxed with a BBQ lunch followed by popsicles, and some frisbee passing, football tossing, and playing of the ever-popular Can-Jam game. The community is looking forward to gathering on campus next Saturday, June 6 at 1 p.m for the full-term graduation and celebration.